Theresa May has admitted a change in her party's approach on tuition fees in England, saying she has listened to voters and fees will freeze at £9,250. Fee repayment thresholds will also rise, so graduates will start paying back loans once they earn £25,000, rather than £21,000, the PM said. She said the whole student finance system would be reviewed and did not rule out a move to a graduate tax. Labour, which wants to scrap tuition fees, called the plan "desperate". 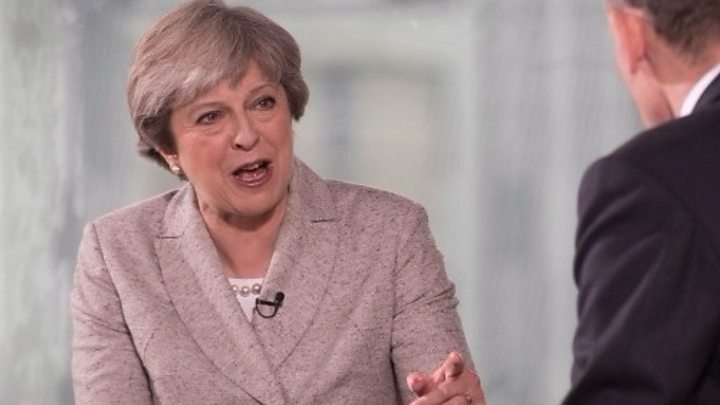 The prime minister, who is in Manchester for her party's conference, also pledged to extend the Help to Buy scheme which helps people buy newly-built homes, in an attempt to win over younger voters. Mrs May told the BBC's Andrew Marr Show she plans to apologise to Conservative activists for her decision to call a snap election. She said the message she had taken from the election, at which she lost her Commons majority, was that the Conservatives needed to "listen to voters," particularly younger people and those who are "just about managing". She said that when the government increased student fees it had been expected that there would be a "diversity in the system," with some universities offering shorter and cheaper courses, rather than always charging the maximum amount. "That hasn't happened. We've got to look at it again," she told Marr. Asked if there could be a graduate tax instead of the current system, she said: "By looking at it again we will be looking at the issues that people are raising, we will be looking at where the system has worked, we will be looking at the concerns that people have." Alistair Jarvis, chief executive of Universities UK, said he wanted to see the government going further by reintroducing maintenance grants for the poorest students and reducing interest rates for low and medium earners. "We also need to do more to reverse the worrying decline in the numbers of part-time and mature students," he added. Sir Peter Lampl, chairman of the Sutton Trust education think tank, agreed that maintenance grants should be reintroduced and also called for fees to be means-tested so those from low-income families repay less. Labour's shadow education secretary Angela Rayner said the move was "a desperate attempt by the Tories to kick the issue into the long grass because they have no plans for young people and no ideas for our country". She added: "They are yesterday's party." Calling this a "freeze" on tuition fees in England is a distinctly positive spin on abandoning a policy of increasing fees above £9,250 only put in place this year. If not a U-turn, it's certainly a Uni-turn. But it shows how quickly the politics have changed - with rising fees and ballooning debts now a toxic combination for any party wanting to court young voters. Although billed as a change of direction, universities had already predicted that a fee rise was "dead in the water" because, without a majority, the government had no realistic prospect of pushing it through. Perhaps more significant is the increase in the earnings threshold for repayments - up from £21,000 to £25,000. Writing on his Facebook page, he said "every single graduate earning over £21,000 a year will pay less". "And it has a long-term progressive benefit too," he added. "As most graduates won't clear their loans in full before it's wiped - by reducing what they repay each year, you reduce what they repay in total too." However, he said details were still "sketchy" and it was unclear who it would apply to. The Conservative Party conference runs from Sunday until Wednesday - when Mrs May will be the final speaker in Manchester. The conference slogan isn't "anything but Brexit", but listen to what the party's high command wants to talk about here in the next few days, and it might as well be. There is a clear attempt by senior Conservatives here to change the subject; stray beyond the ever present - and divisive - topic of leaving the European Union, and flesh out the government's domestic political priorities. Ministers want to be seen to be addressing an Achilles heel for them at the general election - young people, who overwhelmingly rejected them in June. The political reality, though, is Brexit - the defining political issue of our time - will never be far from the lips of people here.